2credit: Break up to 2 barrier subroutines. trash: Bypass a piece of barrier ice currently being encountered, even if it has strength greater than Demara. "It's a matter of 'acquiring' the right credentials." One of the things I love most about Netrunner is the flavor, and as I'd done previously with Omar's breakers, I wanted to give a bit of background for Steve's "fraud breakers." As such, this is a flavor review, rather than utility. First and foremost, this card is named after Ferdinand Waldo Demara, born in Massachusetts in 1921. Author Maria Konnikova wrote about his exploits in her book "The Confidence Game: Why We Fall for It...Every Time." According to her research, from a young age, he was engaged in con-jobs. His first was conning a chocolate shop in his hometown into giving chocolate to his entire class, even though he had no way to pay for it. Small time stuff, right? Well, his next con was joining a monastery under the guise of a monk. He would return to this role throughout his life, even assisting in founding a religious college. Under a false name, claiming to have a degree that he in fact, did not, he taught Psychology at Gannon College in Pennsylvania. He also studied law under a fake name at Northeastern University. However, one of his more famous cons was serving falsely as a naval officer aboard a Canadian vessel during the Korean War. But wait, there's more. Under the name "Brother John Payne of the Brothers of Christian Instruction," he eventually stole the identity of Dr. Joseph Cyr, then becoming the onboard surgeon on the HMS Cayuga. During this medical fling, the only surgical knowledge he had to go on was from a book he had previously convinced another doctor to write; to accomplish this, he told that doctor that the troops needed a reference, in case no surgeon was around. After completing surgeries to remove shrapnel from 19 rescued Korean soldiers, his fame spread, eventually reaching the real Dr. Cyr. However, even after he was exposed, the Canadian navy did not press charges. Demara went on to acquire the role of warden in a Texas prison, but his own bravado lost him the job, as he showed a prisoner an article about his past exploits, thus exposing himself. His biographer, who came to call him "The Great Impostor," was convinced time and time again to give Demara money, in order to "go straight" (i.e. give up con-jobs). However, as always, he returned to his deceitful roots, operating as Chaplain at the Good Samaritan Hospital of Orange County in Anaheim, California. At that point, though, he was too famous to keep up the charade. Even once he was - again - found out, he was allowed to stay on as Chaplain until his death in 1982. There was even a film based on him, called "The Great Impostor," produced in 1961. 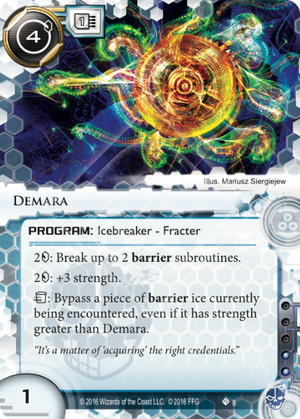 As for the flavor text of the card, it seems to point to Demara's ability to pass himself off as qualified for whatever position he desired, faking his own qualifications. Once you see it you won't be able to unsee it. There is a minion face in the center of the circle of the illustration. About the card. Better than Aurora, it's still expensive in the way nowadays these icebreakers are (being expensive for breaking even cheap ice) but you're in criminal, you should have enough money to spend.